Pranita, like the girl pictured, received a bicycle that will give her the reliable transportation needed to continue her schooling. Pranita looked at her discouraging surroundings. Crowded houses, wailing children and hopeless adults greeted her tired eyes. She and her family live in one of Asia’s largest slums. Pranita’s family had moved to this slum because her father, a construction laborer, had struggled to find work in their previous village. But after years in the slum, every day was still a struggle. Despite their woes, Pranita and her siblings were able to attend a local school, even though this put a financial strain on their parents. Pranita and her younger siblings needed to perform well at school, and this pressure to excel ate away at Pranita. Her fears of failure grew so much that she could barely study. GFA-supported pastor Tuya ministered in Pranita’s slum. As he saw the impoverished children, compassion filled his heart, and he started a Sunday School. Pranita joined not long after. Within months, a change took place in Pranita. Pastor Tuya told stories of a God who could give peace to the anxious and comfort the brokenhearted. Taking these truths to heart, Pranita confided in the pastor about the fears she had about school. Pastor Tuya and the believers encouraged and prayed for her. For the first time, Pranita began to feel at peace. God had answered the faithful’s prayers for Pranita. But another difficulty arose. As soon as Pranita entered 11th grade, she had to walk to school. Walking a long distance alone was not a desirable situation, especially for a young woman. Pastor Tuya noticed this and decided to do something. A few months later, the local church distributed gifts. Much to her surprise, Pranita heard her name called. She had been chosen to receive a brand-new bicycle. 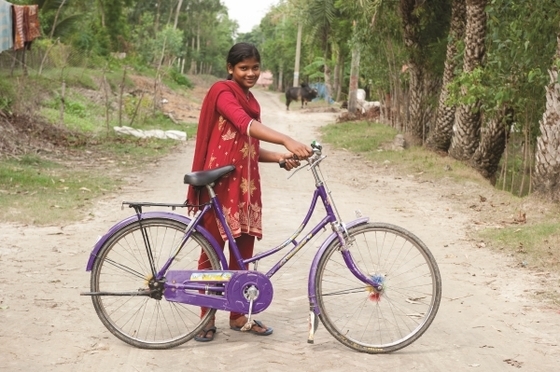 Now, Pranita has no trouble getting to and from school. Her future is bright, thanks to the Lord’s compassion shown by Pastor Tuya and the believers. Like Pranita’s family, millions around the world live in slums, but many have been touched by the love of pastors like Tuya. Stories like Pranita’s are made possible through believers, like you, who give to the ministry. Thank you!